To enable the SBS Acoustic Emission sensor, users must install an AEMS interface card into the appropriate slot of their SBS controller In addition to optically-isolated relay outputs, the Schmitt AEMS card gives an analogue 0 – 10V signal which can be fed into an external data-logger for quality or monitoring purposes. Below are five dresser passes taken from a camshaft grinder with a CBN (Cubic Boron Nitride) type grinding wheel. Each pass represented on the graph shows the noise the diamond dresser makes as it initially touches onto the wheel and then removes abrasive material as it moves across the wheel. In this particular case, a greater amount of abrasive is removed from the wheel on each pass and this is shown in the increasing amplitude in acoustic signal each time. On a flat, non-profiled wheel, an even acoustic signal all the way across the width is desirable. Uneven acoustic signatures or peaks and troughs can indicate a poor dress pass, leading to component quality issues. 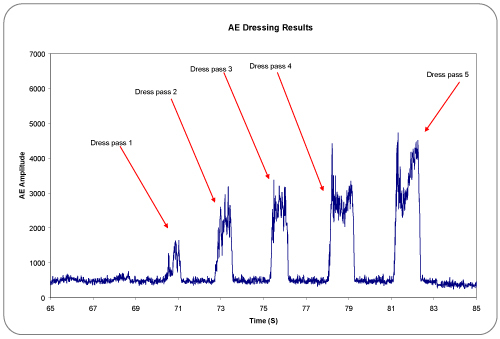 The AEMS product can tell the grinding machine CNC that the acoustic signal has dropped below, or risen above an acceptable level during a dress cycle. The CNC can then repeat dressing until a good wheel profile is reached. Proper application of an Acoustic Emission sensor system minimizes the removal of expensive CBN abraisive material during grinding wheel dressings. Therefore the SBS Acoustic Emission solutions provide a measurable return on investment in terms of material cost savings and minimization of scrapped product.